Notification icon is located next to the language selection button. The number in the red circle shows unread notification count. User can see 3 recent notifications by clicking this icon. 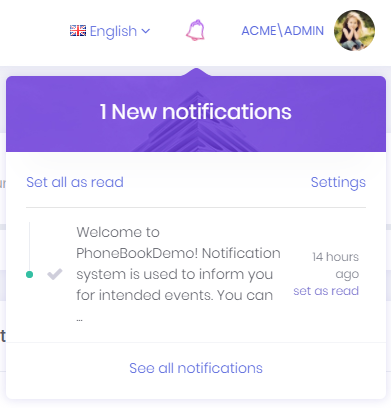 User can marks all notifications as read by clicking the "Set all as read" link or can mark a single notification by clicking the "set as read" link next to each notification. Notifications are sent real-time using SignalR. In addition, a desktop push notification is shown when a notification is received. "Settings" link opens notification settings dialog. In this dialog there is a global setting for user to enable/disable receiving notifications. If this setting is enabled, then user can enable/disable each notification individually. You can also define your custom notifications in AppNotificationProvider class. For example, new user registration notification is defined in the AppNotificationProvider as below. See notification definitions section for detailed information. AppNotifier class is used to publish notifications. NotificationAppService class is used to manage application logic for notifications. See notifications documentation for detailed information. All notifications of user are listed in this page.